Pro-life hypocrisy: Why do states that restrict abortion conceal their methods of execution? 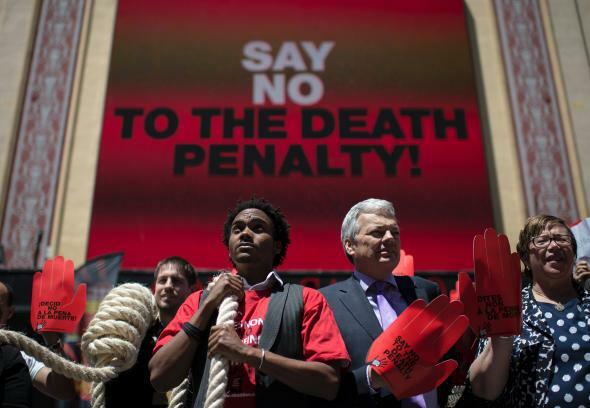 Protesters demonstrate against the death penalty in Madrid, Spain, on June 15, 2013. The debate over concealment of state-sanctioned killing has moved on to another “pro-life” state. Last week, the venue was Texas. There, the state Department of Criminal Justice refused a request from the Associated Press to disclose the pharmacy that supplied the state with drugs for lethal injections. Nobody has proved a connection between these incidents and the improvised drugs. And nobody can, as long as the states conceal their suppliers. The identity of all persons who participate in or administer the execution process and persons who supply the drugs, medical supplies or medical equipment for the execution shall be confidential and shall not be subject to discovery in any civil or criminal proceedings. That’s incredibly airtight. Never mind stonewalling the press. Even if you’re the lawyer for a person scheduled to die, you’re prohibited from finding out who’s cooking up his injection. That’s a remarkably casual attitude, coming from a state that works zealously to identify abortion providers, publicize their methods, and regulate the risks and alleviation of pain. In short, Oklahoma thinks it’s more important to protect the identity of a company that supplies execution drugs than to protect the identity of a woman who gets an abortion. That’s the same argument we heard in Texas. States that have never worried much about harassment of abortion clinics suddenly become concerned when the targets are pharmacies that sell execution drugs. The judge in Oklahoma didn’t buy this argument. “The secrecy statute is a violation of due process because access to the courts has been denied,” she ruled. The state is appealing her decision, but either way, the debate won’t end here. The AP says at least two other states, Arkansas and Missouri, also suppress information about how they do their executions. That’s four states, all of them hostile to abortion. They call themselves pro-life. Are they?